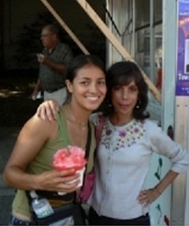 Feng Shui Long Island's Blog: Sangenario Feast 2015 NYC! This year has been by far the most packed I have ever seen and experienced when attending the Sangenario Feast. It felt like new years all over again. With so many food venues to choose from, drinks and various games to play, lower Manhattan felt like a huge party on the streets of Little Italy. The 89th Annual Feast of San Gennaro will be held in Little Italy for 11 days from Thursday, September 10, through Sunday, September 20, 2015, on the streets of historic Little Italy, the lower Manhattan neighborhood which served as the first home in America for hundreds of thousands of Italian immigrants who came here seeking to improve their lives beginning in the early part of the 20th century. Wow--that is quite a crowd of happy festival goers, Laura! It looks like the weather was perfect, too. Gosh, that looks so good, Laura! Love the atmosphere and the look of the food.